My Blogger Buzz: How to Write Your First Blog Post? If you have chosen your website niche and willing to start your personal blog, then this question surely strikes in your mind that "How to write down your first blog post? " 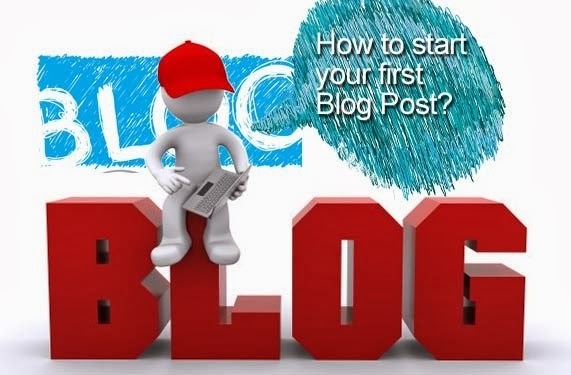 If you are also facing identical question then you definitely are landed around the perfect post because here I am sharing many effective suggestions to write your own first blog post. Your first blog post should get everything including your blog's reason, who are classified as the targeted visitors, niche of one's blog and so on. You should really write your own first blog post in a fashion that can set your blog's strengthen for readers in and for different bloggers.So lets start. Below I have listed best points to include in your first blog post. You should start your post with a short intro about yourself. Tell your readers that who you are and what do you do. The more you describe yourself and your business more the readers will trust you. Share your expertise with readers so that they can trust you and ask for your help. Make sure the information you are going to share is true, because if somehow your readers find that you are providing the false information then it will be difficult to regain their trust. You should clarify your motive that why you are blogging. This will show your intentions, your readers will get an idea that why should they read your blog and what they will gain after reading your blog. Consider your audience and tell them your motive to blog. Your topic to write about will decide your audience, you should describe your topics well so that readers can decide what they will get from your blog. Spell out your topics so that readers can expect what they will know when they read your blog. If someone like your topic then he/she may bookmark your blog, which will help you to have regular readers for your blog. Contact info is must for an online community, if you are going to start your own blog then you should give contact info to readers to contact you. Your first blog post should have your contact info that may be your e-mail id, phone no. or any thing else. This will help you to build readers trust in you which help you to have a long and successful blogging career. I hope the above points helps you and you successfully write down your first blog post. Now It's your turn to share this post with your friends and write your precious views in comments till then Peace, Blessings and Happy Writing.